Frieda Loves Bread: Yes, There is a Fairy Hobmother! 28 Yes, There is a Fairy Hobmother! Have you seen any posts about the Fairy Hobmother? Did you know that the Fairy Hobmother's job is to sprinkle fairy dust from Appliances Online into the blogosphere and grant wishes to our readers? I've left a wish or two on other blogs, but quickly forgot about it. Greetings from the Fairy Hobmother! I'm the Fairy Hobmother! Spreading joy and happiness through the blogosphere and your blog drew my eye. Did you know that if you leave comment on this post, the Fairy Hobmother may pay you a visit as well? I received an Amazon gift card from the Fairy Hobmother. All opinions expressed in this post are 100% mine and not influenced in any way. I love coconut! Thanks for the recipe link! Oh how fun to have a fairy hobmother. But how could she resist this delightful cake? My favorite dessert? Tough one - great gelato maybe? Deep, dark choclate cake? Flavorful lemon tart? Crunchy cannoli? Who can choose when there are so many, options? Congrats on your visit from the Fairy Hobmother! My favorite dessert is cheesecake. Delicious on its own or topped with fresh strawberries this time of year. Mix pudding & milk until thick. Add sour cream and 4 oz. Cool Whip. Layer wafers on bottom of dish. Slice bananas to cover wafers then add half of pudding mixture on top. Repeat layers ending with pudding on top. Spread the last 4 oz. of Cool Whip on top. Chill before serving. Triple Chocolate Cheesecake is one of my favorite desserts, although quite rich so I don't have it very often (less than once a year). Premium ice cream, preferrably homemade. Second would be pie. Pecan at Thanksgiving just once a year. Yes, homemade ice cream is a must! It's a tough call! My friend's chocolate fudge cake with fudge frosting is to die for, but I make a pretty mean baklava. Those are certainly my favorites in the "chocolate" and "non-chocolate" categories. This is really tough. I read everyone else's posts to get ideas...I love sweets, so this is wide open for me. My current favorite is probably the Peanut Butter Oatmeal Chocolate Chip Cookies I discovered over at ::Steph Chows::. My very favorite dessert is caramel cheesecake! I really want to try your white sheet cake, it looks delicious! Brownies with mint ice cream is my favorite combo! I really can't decide. I love all desserts! My favorite dessert is Boston Cream Pie and always has been, since I'm from Boston. 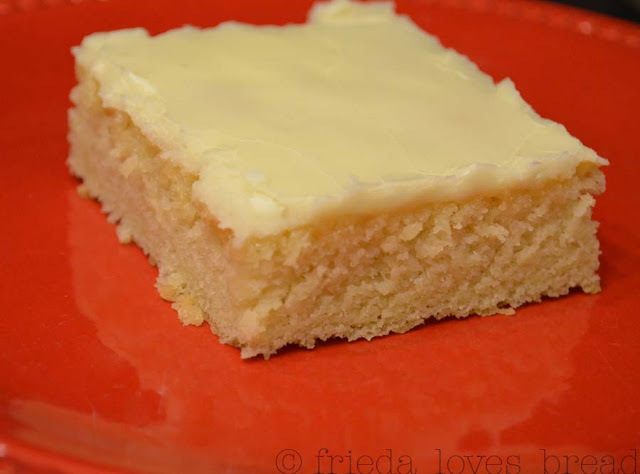 I have made your recipe for the White Texas Sheet Cake and it is truly wonderful. It freezes well too! I have never tried a Boston Cream Pie...do you have a great recipe? Good to know that the cake freezes well ~ do you freeze it with the frosting on it? My favorite dessert is one that my family requests for every single birthday, ever since my friend Judy introduced it to us! Make a german chocolate cake mix according to directions. Immediately poke holes in cake as it comes out of the oven with the end of a wooden spoon. Pour a botttle of Carmel ice cream topping over the top. (Can use any Carmel ice cream topping - and some people pour a can of sweetened condensed milk also --but optional) You may need to warm up the topping in the microwave first. Let Cool. Top with 1- 8 oz carton of cool whip. Break up 3 Skor bars (or heath) and put on top. Keep in Fridge! I just had a flashback to my college baking days where a roommate of mine made Turtle bars with the same cake mix and melted caramels. Your idea of using caramel ice cream topping sounds a LOT easier than unwrapping 50 or so of the little squares of caramel! Almost anything sweet but if I could choose just one, it would be the chocolate cherry cake; made with a chocolate cake mix, a can of cherry pie filling and 2 eggs, then frosted with chocolate icing. I can't stop eating when I make it so I try not to make it too often but it is sooo good. My favorite is peanut butter cake, with peanut butter frosting and of course, topped with chunks of peanut butter cups! Seriously the BEST! My favorite dessert is Cheesecake. Turtle cheesecake is probably my most favaorite. Chocolate and caramel. What's not to love? Holy cow, how fun! I've never heard of the Fairy Hobmother. Dessert of any kind is always welcome in my tummy, but I really love fresh, slightly underbaked cookies. Oh, man, there's nothing like a warm cookie.